One of the European Union’s key pillars is the free movement of persons, which allows citizens of EU states to move and settle in other countries in the region without restriction. Even nationals of Switzerland and the EEA countries (Liechtenstein, Norway and Iceland), which are not members of the EU, can live elsewhere in Europe as long as they are employed or have sufficient means with which to support themselves. 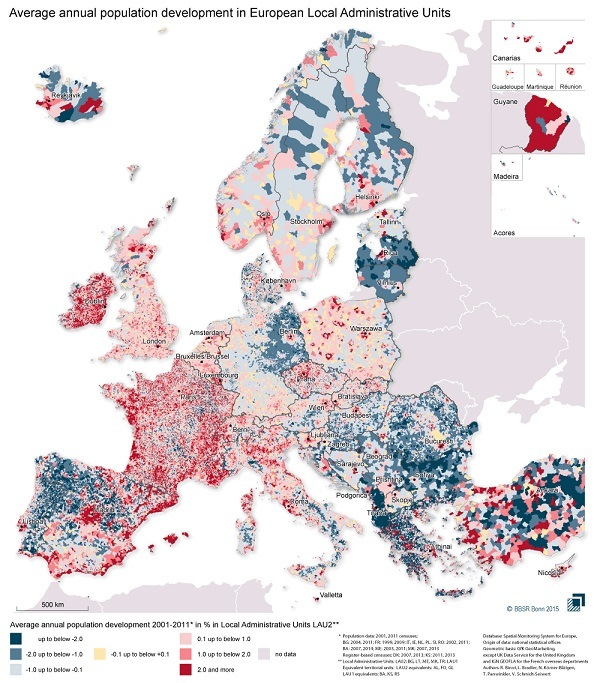 Germany’s Federal Institute for Research on Building, Urban Affairs and Spatial Development has created a map using data from between 2001 and 2011 showing population changes in that period across Europe, going down to the municipal level for granular detail. The map shows deep red ring around Madrid, which suggests a compound annual growth rate of the population in that area of more than 2%. Spain’s eastern coast, on which Barcelona, Valencia and the Costa Del Sol lie, shows uniform population growth rates of at least 1% (and in many cases more than 2%). These areas have apparently been drawing from the northwest of the country, which shows heavy population loss, likely from outward migration, of at least 1% per year. Much of Portugal’s map shows population loss as well, although Lisbon has increased its population over the 10-year period tracked by the Germans. Large swathes of the eastern European countryside show significant population losses, especially around in the north of Bulgaria. Interestingly, Bulgaria’s capital of Sofia does not show a commensurate population growth, which suggests that most of these people left the country for other European nations in the four years from 2007-2011, following accession to the EU. However, many western European states (including the UK, Italy, Ireland and France) required work permits for Bulgarians and Romanians during this period as part of transitional controls, so their destinations are unclear. Berlin is the only significant growth area in former East Germany, with the population in the rest of that region dropping by more than a percentage point each year from 2001 to 2011 on average. Ireland is almost completely dark red, while France and the UK both show relatively uniform red areas (denoting population growth) on their maps. However, although all three countries are popular business and migration destinations, they also have the highest birth rates in Europe – 16.5, 13.0 and 12.8 per thousand respectively in 2011, the last year shown on the map. Migration is likely also to have helped the UK and Ireland, which are Europe’s only English-speaking countries, and both are driving investment with competitive tax rates. If your business is serving a local population, then it pays to be where the people are (and where they are going to). By following the trends shown in this German map, you can get an idea of where populations are growing fastest and thereby figure out where to look more closely. Of course, in those cases you will also need to look at demographic information to ensure that this is the right kind of population for your business to serve. On the other hand, if your business is land- and labour-intensive, and you are looking to minimise costs (for example if you run a manufacturing or textile business), the blue areas of the map are often good low-cost regions in which to set up a business. 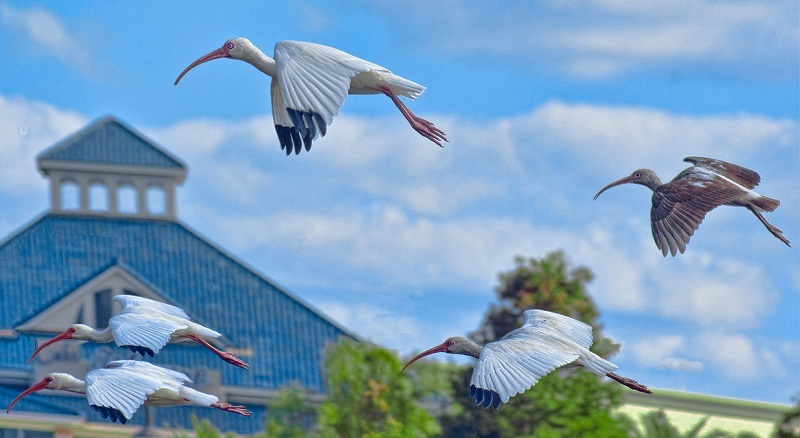 In addition, these changes typically spur government schemes to restore the areas, meaning that tax breaks and other incentives may be available. Healy Consultants Group PLC can help you to research market data and local regulations to find a suitable location for starting or expanding your business in Europe. To learn more about the markets listed above, visit our pages on company registration in Spain, Ireland, Germany and Poland or contact our consultants directly at .